Prevent your floors from being damaged by water with waterproof flooring in Downingtown, PA. Our showroom carries a full selection of waterproof vinyl flooring, laminate, carpet, and more. Whether you’re looking for waterproof laminate flooring for your kitchen or waterproof carpet for the bedrooms, we have something to suit every room in your house. Stop by our flooring store to peruse our extensive selection of flooring options and be sure to schedule waterproof flooring installation with our skilled professionals. If you’re not sure what style of waterproof flooring would best suit your remodeling project, feel free to ask our sales and design professionals. We’re happy to show you samples of all our flooring and discuss your project in-depth to help guide you to the perfect flooring styles to suit your needs. COREtec: COREtec waterproof flooring has a durable waterproof core that adds resilience and years of performance. When it comes to waterproof luxury vinyl, COREtec is one of the leading names in performance as well as style. 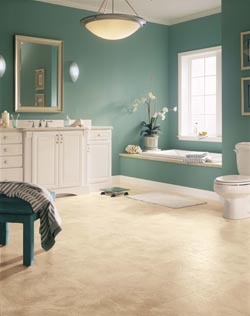 Shaw: With waterproof carpet and vinyl available, Shaw is another trusted name in water-resistant flooring. Whether you prefer the comfort of carpet or the elegance of vinyl hardwood, Shaw has a waterproof version perfect for your home. While many people may assume that waterproof flooring is only necessary in the basement, kitchen, laundry room, and bathrooms, the truth is that it’s an excellent option for every room in your home, even those on upper stories or the attic. During severe weather, your roof may become damaged and start leaking. Waterproof flooring in every room means you don’t have to worry about water damage, mold growth, or damage to your subfloor. After you’ve chosen your new carpet, vinyl, or laminate flooring, be sure to schedule waterproof flooring installation with our skilled and dedicated professionals. We’re able to properly remove your old flooring, prepare the subfloor, and install your new flooring so it’s watertight and sure to look and perform great for many long years.